Super helpful, interesting non-fiction? Yes, please! Summary: How are habits made? How are they broken? How are they perpetuated? These are the macro questions that Duhigg addresses in a Malcolm Gladwell style pop psychology delight. 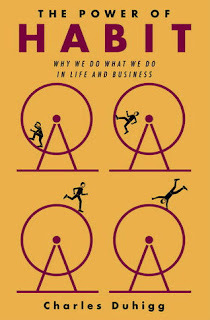 Duhigg looks at examples from the personal, business, and scientific arenas to unpack what he calls "the Habit Loop." Thoughts: A book in this ilk is particularly appealing to book purveyers because of it's wide net. Who doesn't have at least one annoying habit that they want to break, or a good one they want to take up? Duhigg tackles the Habit Loop by looking at its 3 key components (cue, routine, reward), and then examines points of variation and/or decision making that happens at different points in the cycle. What I appreciate about Duhigg's approach to this topic is that he is repetitive and consistent. That could be a problem in the hands of a lesser author, but in this case, he uses reiteration with slight variations to peck away at various parts of the habit loop. For example, he devotes a good number of pages of to the company Alcoa and the man who took them to the next level. Paul O'Neill took over as CEO- coming from a bureaucratic background, he had seen the ripple effects that one change to a routinized organization could have. He made a single commitment to the stockholders: he would make Alcoa the safest place to work that he possibly could. At first, this befuddled everyone. As time went on, however, the entire corporate culture began to change as everyone's incentives were completely aligned to putting a premium on the safety of the workers. Production became more efficient, employees were empowered to communicate their ideas to management, and union relationships improved. Stock prices soared. 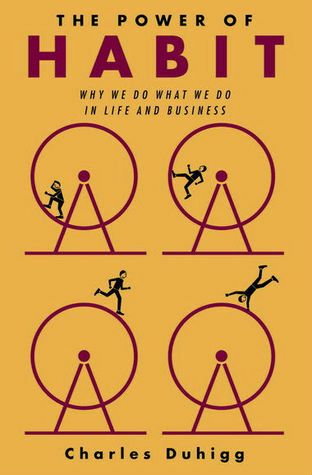 From this, Duhigg draws persuasive parallels to the power of disrupting the habit loop on an organizational level. This is one of dozens of anecdotes, all of which sum up to a pretty extensive laymen's understanding of the neuroscience, psychological, and social components of habit formation and perpetuation. The self help portion of this book is more implied than explicit, but I think this is what helps Duhigg maintain the authority the rest of the book conveys. Rather than trying to sell you on some self-serving principle (buy my milkshakes and you can lose 20 pounds in 2 days! ), he is basically advocating for mindfulness. The whole point of habits is that our brains want to learn how to turn themselves off for routine tasks. He is merely pointing out how we can be aware when our brains want to do that, and then suggesting ways to counteract our basal ganglia. He also points out small ways to teach our brains to expect new, healthier habits. There is nothing extreme or reactionary in the few suggestions he does offer, and for the most part, he has crafted his presentation of the data to make the appropriate inference plain. This is a shining example of what journalistic pop science writing should be. It is entertaining, clear in its scope, and reasonable in its claims on your subsequent behavior. Here's hoping that Duhigg finds more topics to elucidate for us! What was the last book you read that inspired you to try something new?